Coco Growers You're in Luck! Buddhas Tree Coco A&B has Arrived! Year after year, Buddhas Tree has led the industry in the design and development of high-quality additives. Finally, there’s a base nutrient that every coco grower can trust, Coco A&B. It is a first-class base nutrient that contains all the necessary nutrients that plants require when prospering. As coco growers all over the world are eager to utilize a base nutrient created for plants nourished in coco, Coco A&B arrives to give them exactly what they need. Buddha’s Tree has primarily specialized in additives, but took a much needed turn with the creation of this product. The full set is now available and it makes it easier for growers to utilize quality products in their growth process. 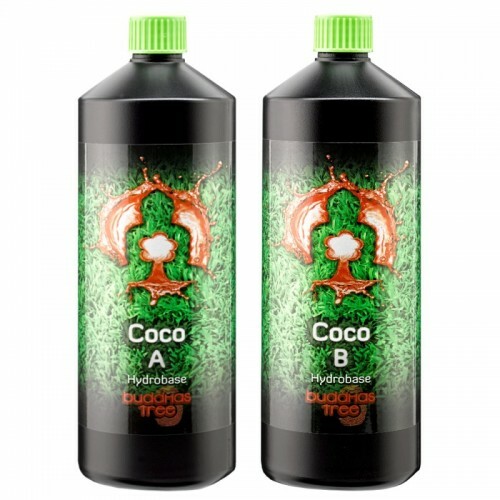 Buddha’s Tree Coco A&B functions as a base nutrient that works hand-in-hand with plants reared in Coco. It renders all the primary nutrients that plants need to grow strong and vital during each developmental phase. The formulation of this base nutrient is paired with chelated nutrients for simpler and more rapid absorption and uptake of nutrients. While Buddhas Tree Cocoa A&B may be one of the most innovating creations for cocoa growers today, it is essential to understand how to utilize it properly. Improper or incorrect application of use can lead to reverse results and eliminate the success of the expected outcome. The process of use is simple, hence the user-friendly claim that the product boast. It helps to understand the basic approach and activation of coco A&B prior to use. Packaging contains easy to read and easy to follow instructions. For your convenience, the following outlines the basic guidelines for the use of Buddhas Tree Coco A&B. Fill the reservoir of the hydroponic system with water. Add equal portions of Coco Part A and Coco Part B to attain the mandatory strength and mix thoroughly. Check the strength of the nutrients (TDS) utilizing a CF/EC/PPM meter and a syringe beaker to secure a precise measurement. Continuously add Coco A + B to obtain desired strength. Next, add additional boosters and additives at this time if you wish. Mix well. Make necessary adjustments to the solution’s pH when required. It is recommended that you utilize a pH meter to properly set the pH to the level that is required. Be sure to wear protective gear and avoid permitting contact with eyes and skin. Both parts of the dual part nutrient are created to interact in equal amounts. Utilizing the nutrients in uneven amounts will lead to an unbalanced nutrient solution, which will eventually lead to plant deficiency. Remember to never mix enhancers, additives or nutrients together in their resolute form or directly from their container. Be sure to mix-in each additive, nutrient, booster or enhancer to the water or feed-solution water. Finally, stir consistently to mix well prior to adding the next additive. If parts are both added in at the same time, they could clump preventing them from being properly absorbed. The process of placing Coco A+B in the reservoir should be carried out with 2.4ml A and 4ml B per Litre per adult plant. EC reading should equal about 1.6. 2ml A + 2ml B mixed in 1 litre of water for young plants. 4ml A + 4ml B mixed in 1 litre of water for established plants. Always add water to A mix before adding B mix, and never mix directly together ensuring both bottles are shaken well before use. This product is suitable for all watering systems and it easy to mix as it dissolves immediately when prepared properly. Buddhas Tree category of additives are among the best available in the hydroponics market. 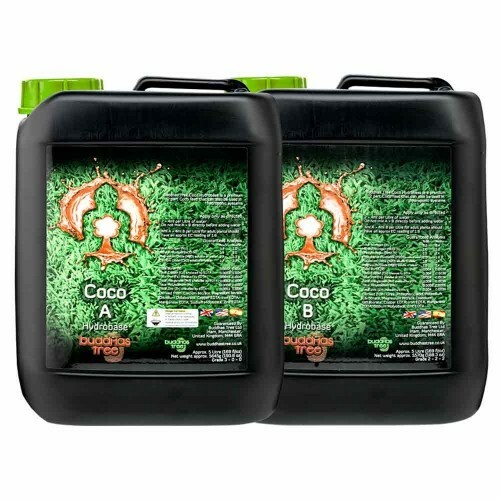 Coco A&B is a prime dual part feed, which contains the nutrients that plants crave to experience an abundance of healthy growth and prosperous bloom cycles. This unique combination of coco is comprised of all the preliminary mechanisms necessary for optimum development within coco, to include chelated nutrients to permit simplified nutrient processes. 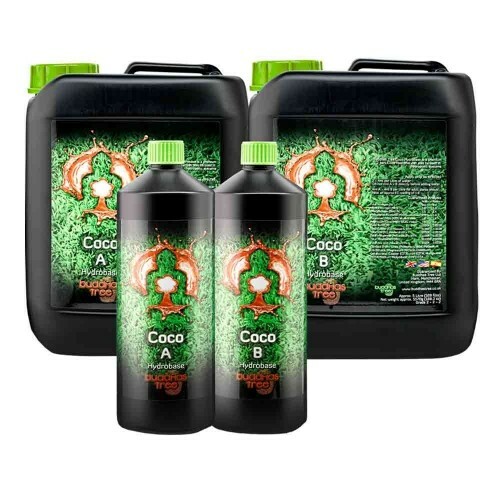 If you are a coco based plant grower and desire to find a formula created just for your efforts, Buddhas Tree Coco A&B is the only option you’ll need. Watch your growth cycle transform and reach levels you thought you’d never achieve. It simplifies the approach while maximizing the outcome of your planting process.